The halt in production in mines surrounding the dams will reduce Vale’s production of iron ore by 40 million tons per year, ten percent of the company's annual production. RIO DE JANEIRO, BRAZIL – Vale, the mining giant of Brazil, announced on Tuesday that the company will eliminate ten dams similar to the one which caused the disaster in Brumadinho last week, when it ruptured. Vale estimates that the plan will cost the company approximately R$5 billion and will decrease Vale’s production by ten percent. 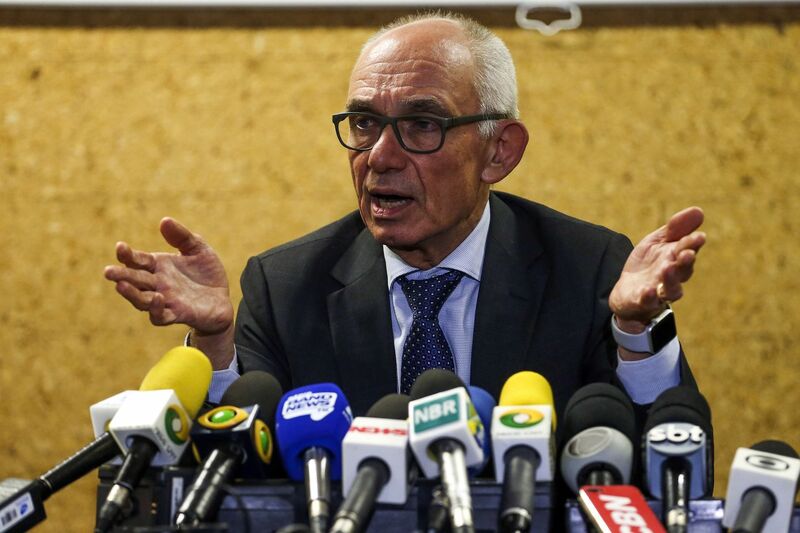 Vale president, Fabio Schvartsman, speaks to reporters about the elimination of dams such as the one in Brumadinho, photo by Valter Campanato/Agencia Brasil. “The decision of the company is that after this disaster happened, we can no longer live with this type of dam, we made the decision to eliminate with all the upstream dams, decommissioning all of them with immediate effect. To do so, it will be necessary to halt mining operations at all sites that are in the vicinity of these dams, ” Vale president, Fabio Schvartsman, said in a press conference on Tuesday. According to the executive in all ten dams are expected to be decommissioned and are all located in the state of Minas Gerais. Schvartsman said decommissioning the dams means preparing them ‘to be integrated with nature’. “The decommissioned are no longer dams and are emptied and integrated into the environment,” said Schvartsman. The project is expected to be presented to federal and state agencies in 45 days. According to Schvartsman, the decommissioning of the dams will take anywhere from one to three year to complete. According to analysts, the halt in production in mines surrounding the dams is expected to reduce Vale’s production of iron ore by 40 million tons per year, which represents ten percent of the company’s annual production. “This represents an unprecedented effort by a company to give a complete response to the tragedy of Brumadinho,” concluded the CEO.